This was supposed to be a story of how Alfie spent an hour living out his dream as a bin man. It comes with the subtitle “chocolate cake is the destroyer of dreams”. 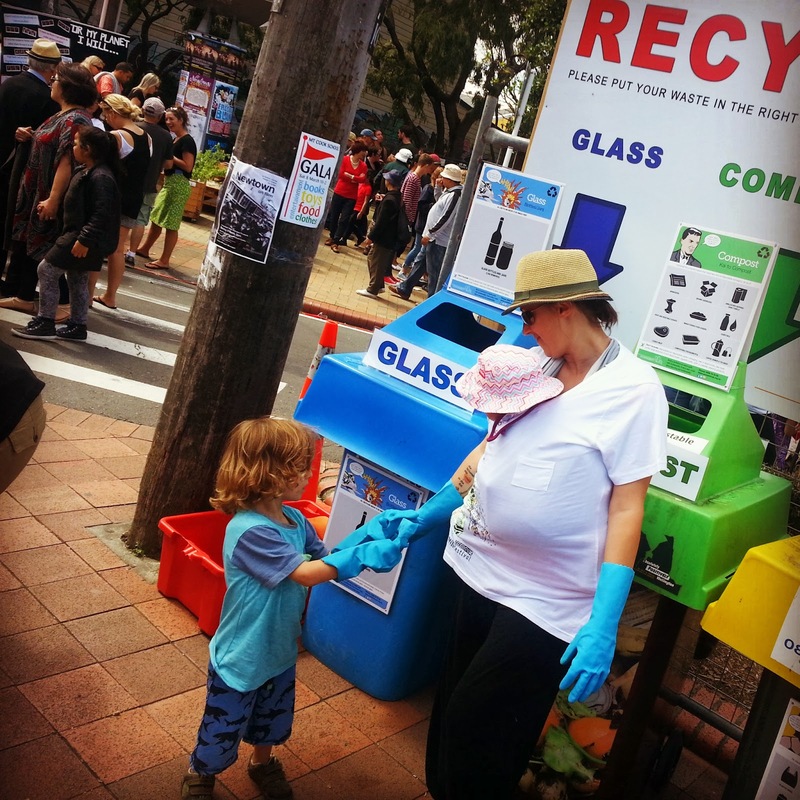 When Alfie and I went to a briefing session about recycling last week, it was actually training for volunteers who were manning the Recycling Stations at the Newtown Festival. I had replied to a shout out and all credit to the coordinator who welcomed me and my extremely zealous four year old with open arms. If she had reservations about the wisdom of actively encouraging a pre-schooler into her carefully planned sustainability work, she hid it well. Had she realised I was about to be the near architect of our collective undoing she may have been a little less supportive. Come Sunday when we were booked in to help the public with their rubbish sorting needs, my son was coming down off a two day early morning fridge raiding cake binging session. Which is always a recipe for success. But I didn't because DAMMIT BOY, THIS IS YOUR CHANCE!! PEOPLE!! WITH ACTUAL RUBBISH!!! ... FOR YOU!!!! When 2 o’clock rolled round and we elbowed our way through the crowds to the recycle station, it was with a tired/ hungry boy, a sleeping baby on my chest, and a sinking feeling that this was the worst decision since Laura Bow convinced me that Mark Anderson fancied me and that I should write him a letter saying I fancied him too. Primary school was brutal in the 80s. Mercifully I underestimated Alfie’s resilience/ stubborn streak. I am often left speechless by how proud I am of my children. This was one of those days. Alfie somehow rallied, stuffed his tiny hands into those enormous rubber gloves and organised rubbish like a pro. He politely helped me take compostables, bottles and cans from people walking past and posted them into the right bins. We high fived our rubbery hands and danced to the bands on stage and for forty long minutes, there was no hunger or tiredness. Of course after that he realised that he needed the toilet and went off with Keith while I finished the shift but still, PRIDE ... and not just in my son, I am so proud to be living in a country that gives me the opportunity to support Alfie’s slightly offbeat obsession.